Beef mami is one of the favorite Chinese food among Pinoys and maybe the reason why Chowking is so popular. There are many version of mami soup like chicken or wonton but beef mami is the tastiest of them all. 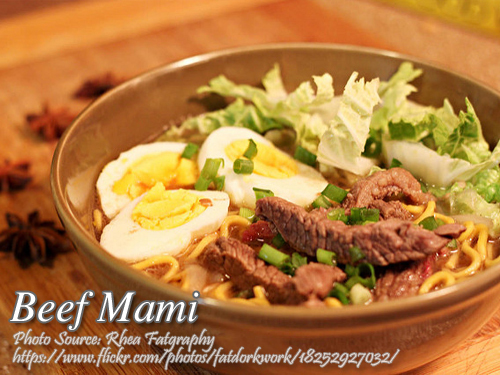 This beef mami dish is simple to make and requires only a few minutes to prepare. The cooking time is also not that long, but because beef is tougher than chicken or pork, it requires longer time to tenderize. It will depend on which part of the beef you will use. Briskets or flank requires less than an hour to tenderize but if you will use a pressure cooker, it will only take half an hour. You can also use other beef parts like ribs or tenderloin but if you ask me, my favorite part are those with lots of connective tissues with a rubbery texture. In a medium size pot, heat oil and saute garlic until fragrant. Then add onion and saute until soft. Then put in the beef and saute until it becomes light brown. Add water, star anise, beef cube, salt and pepper and bring to a boil. Remove scum that floats on the broth. Cover and simmer for about 45 minutes or until the beef is tender. In a serving bowl, arrange and place the chopped Chinese cabbage and egg noodles or miki. Pour some broth on the bowl just enough to cover the egg noodles and some pieces of beef. Garnish with sliced hard boiled eggs and spring onions. Serve hot. Hi, Manny…your beef Mami tastes much way better than Chowking’s Al Khobar Mami. Hi Nelson, I’m glad you liked the recipe! Thanks for your kind words!